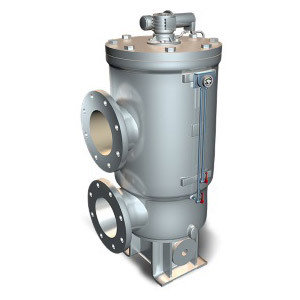 The ACP filters are automatic filters based on continuous backwashing driven by a hydraulic motor. They are totally independent from external power sources, as the driving oil is the same filtered oil. These filters are able to control the Lube Oil Quality, removing from the system even the finest particles, as the carbon residues with a size of few microns, thus putting an end to the dangerous concentration of contaminants in the Lube Oil. The ACP filters can be designed to perfectly match the engines interface. ACP operates using only the Lube Oil’s energy. Use of filtered oil driven by an hydraulic motor for the continuous cleaning process eliminates the need for external power supply and compressed air. High backwash efficiency with no preferential routes, due to unique design, using small quantities of flushing oil prevents any significant drop in the operating pressure. High quality ductile cast iron body. The stainless steel armoured cartridge is capable of withstanding up to 10 bar (145 psi) of differential pressure. No overflow valves or second filter stage are required for the protection of engine parts, extending the life of the engine itself. ACP is easy to install, easy to maintain since consisting of only one filtering element and few parts, regardless the size of the filter. No special tools or liquids are required. Easy also to retrofit as an upgrade of existing installations.